A long-time devotee of Westerns, despite being Welsh, Jack Martin published his first Western novel this year. 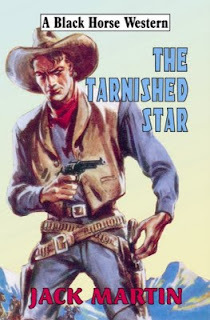 The Tarnished Star (Robert Hale) is an old-style Western about a sheriff who finds himself on the run from hired gunmen. Congratulations, Jack, on publication of your first novel, The Tarnished Star! Tarnished Star’s a traditional Western, and I make no excuse for that. You can have social commentary and tackle serious issues that are relevant to today’s society and all its ills. But sometimes it’s good to have some pure escapist fiction with thrills, suspense, and action. That’s what I hope Tarnished Star provides. What was your favorite part of writing The Tarnished Star? That’s a difficult question—I’m not sure how to answer that. Sometimes I very much enjoyed the writing, but at other times, when inspiration was short, it became something like trudging uphill thorough heavy snow. But, and stretching the metaphor somewhat, when the thaw came things were coming up roses again. I think the creation of any novel is half agony and half ecstasy. You’ve just got to go with the flow. I still love Westerns, and I know other people who do, too. Why do you think the popularity of Westerns has declined? I’m not sure if the Western has really declined, but it’s definitely not as visible as it once was. I think there was a lot of overkill at one time and the Western started to parody itself, but there’s always been good work out there in both books and movies. I think now that the Old West is drifting further and further into history, the books are starting to have an historical worth. These days there seem to be two kinds of Westerns—the revisionist and the classic, escapist kind. There is room for both. And another good thing that not only affects Westerns but other genre fiction is that pulp-style fiction is starting to get the image of being cool when once it was frowned upon by pompous bores. It used to be that even writers such as Raymond Chandler, these days an acknowledged genius, would get only grudging praise. How did someone from the other side of the pond come to love American Westerns? I was brought up on a diet of Westerns, and the sense of freedom that goes with the genre appeals to the wanderer inside me. When I was a kid, John Wayne seemed the ideal to me, and I always preferred Westerns to any other kind of entertainment, a passion I inherited from my grandfather. When my friends were watching “Star Wars,” I had my nose buried in a Louis L’Amour. I used to think this was strange myself and that to write Westerns you had to be American, but then I thought, that’s crazy—H.G. Wells didn’t come from Mars, and Jonathan Swift certainly didn’t hail from little people land. The West of the Western is a mythical land that never really existed and is as much a fantasy as, say, Middle Earth. It’s an imaginary place and I think anyone, anywhere, can set stories in this landscape of the imagination. But the Western is as much an attitude as anything else. And what I mean by this is that it’s all about being an individual and realizing a person is in charge of his/her own destiny and that we all have this inner strength. Mind you, it’s also about fun, adventure, and frolics. I don’t think you necessarily even have to visit the Western states to write a Western. Mind you, I am looking forward to visiting the US for the first time next year and seeing some of these places that have been a part of my imagination for so long. To many people, names like Arizona, Texas, Colorado, and many more may be nothing but place names, but to me they sound like strangely magical places the exist somewhere over the rainbow. I know I’m romanticizing things, but I don’t care because anywhere is what it means to you, and the West is very much a part of my makeup. Ian Fleming has always been a favorite—I don’t think any writer has ever mastered pacing the way he did. British Western writers such as George G. Gilman hugely impressed my young mind and still do and kept my interest in the West when times were lean. And for many years Stephen King and James Herbert encouraged my imagination. But I’ve so many writers I admire—Louis L’Amour, Mickey Spillane, Owen Wister, Elmore Leonard. These days I’m enjoying the works of Richard Stark, Raymond Chandler, Elmer Kelton (who just passed away in August), and a lot of the old pulp writers, whom I am actually reading for the first time. And I think Max McCoy is a brilliant modern Western writer. But I guess in some way everyone I’ve ever read has influenced me to a degree. The imagination is like a sponge and it soaks up all kind of things. Independence and self-reliance are very important to me, and I think every character I’ve ever created holds these traits as a core part of their makeup. I like the theme of the Everyman facing up against huge odds and prevailing. It’s a classic theme—goes all the way back to David and Goliath. But then again, I also love to read about adventure and exploration. Hey, I like a gunfight as well as the next man. As actor Gary Dobbs, you’ve appeared in episodes of “Dr. Who” and “Torchwood.” Who is your favorite Doctor? Well, I grew up with Jon Pertwee, and I never missed the show in those days. I’ve liked them all, though, and I think each has brought something to the character. Matt Smith, the new kid, is going to be superb. I’m an odd person and I have no set routine other than to write something everyday, but when I’m working on a story it demands every waking moment. When not actually writing I’m churning things over in my mind. Obviously there are times when I just don’t feel like it, but you’ve got to be firm and get down to it. It’s like any other job, and the more you do it the better you will become. Keep at it, no matter what. There will be times when you think you’re wasting your time but ignore these negative feelings that are part of all creative endeavor. Just keep going, pushing, shoving, and always have a belief in yourself that will carry you through the rough times. When will your next book, Arkansas Smith, come out in the United States, and what will it be about? Arkansas Smith is an enigma—he is intended to be a series character, and he should grow through each book so that the reader gets to know more about him as we go along. In the first novel, which is to be published in the UK next March and will be available at the same time in the US, we get his origin, and believe me, it was a grim and gritty beginning. But there is still much that we don’t know about the character, and at the end of the book many questions will have been answered but a great many more will have been thrown up. He’s a classic Western type character, but he is something of an enigma, known to the Sioux as The Whispering Wind, and hopefully this will endear him to readers and keep them coming back. Book by book I plan to place Arkansas in every situation of the classic Western. I want to use all the clichés but at the same time make them somehow fresh. 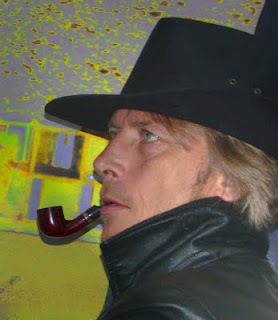 Jack, thanks for visiting my blog, and good luck with your writing and acting. Thanks it’s been great talking about myself. Great interview. as always. And this was a good book. BTW, thanks much for the key chains and bookmark. I'm using them already. Another great interview from a rising star from the Black Horse Western stable. Tell us more about the Arkansas Smith books, Gary. Is this with Robert Hale too? Top interview. Jack Martin is a talented writer. Great interview, Tarnished Star is recommended reading for western fans. THANKS EVERYONE - and Ed - yeah Arkansas Smith comes out from Hale next March. I really enjoyed your visit to Shauna's blog. Thank you for sharing your love of Westerns with us. I think The Tarnished Star will renew many people's interest in the Old West! CHARLES, I'm glad you got your prizes and like them. ED/LEE, thanks for stopping by for Gary's interview. PAUL and STEVE M., thank you. I'm glad you enjoyed it. LAURIE! Thanks for visiting. Come back again. I'll have a contest on the 16th with free books as prizes. I enjoy westerns, books & movies, so it's great to hear about Jack's debut novel.